Ring road aka Route 1, is 828 miles long road encircling Iceland. As per legend, Gudmundur, Iceland’s patron saint, put a spell on this path, whoever will complete this circle will fall in love with Iceland, forever. Okay, okay, I made it up, but it is true! 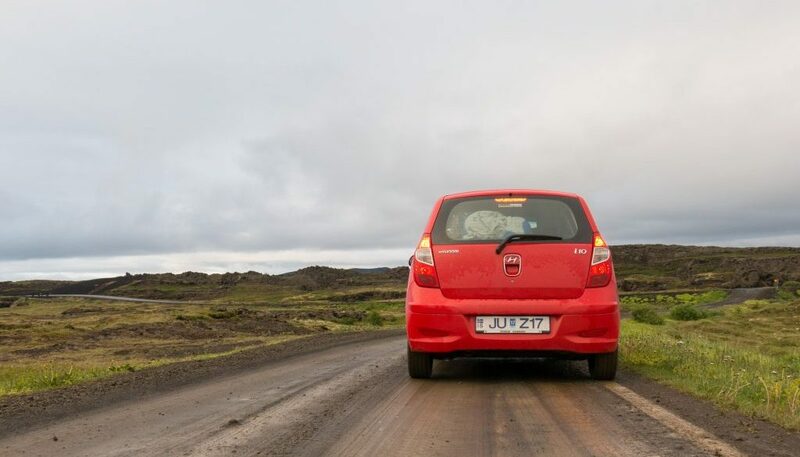 Ring road trip is an excellent way to experience the richness and diversity of Iceland. I planned to admire the splendor of Iceland for 21 days in July with my family; 11 days for walking the trails and 10 days for driving ring road. Here is the recount of 10 days of my epic road trip done in partnership with trusty little red Hyundai i10 and company of Navjot and our kids. First on the list was the no-brainer Golden Circle, which includes three unique features reminding the impermanence of everything around us. Golden Circle is perfect for those who are on tight time budget. It is a perfect sampler of Iceland, cames with a legendary waterfall, the original Geysir (root word for all of them), ripping tectonic plates and the site of world’s oldest parliament. Impressive Gullfoss plummeting down with a thundering roar, a show of sheer power of the water, it was the opening act and took me by storm. I stood there mesmerized by its immensity, listening it’s music and letting it’s mist drench me. Two famous geysers Geysir and Strokkur spewing boiling water, powered by the fire under our feet. Fire always stirs some primordial instinct and chokes me with emotions. Alþingi is the oldest parliament in the world and was founded in 930 at Þingvellir, which is part of Þingvellir National Park. This park is slowly expanding as tectonic plates are slowly ripping Iceland apart, making us wonder how our earth will look long after we are gone. It is also considered one of the best places to dive. Don’t miss it if you are a diver. With awestruck hearts, we headed to a backpackers hostel close to Geysir. It was our first night at Iceland, and it took some time to sink in that we were in the land of magnificent Midnight Sun. Next day, we turned back towards Reykjavik, for a two days detour to Isafjordur, a town in Westfjords peninsula. Once we got off the ring road and entered Westfjords, it started drizzling, washing the vast mossy landscape gently. Within half an hour mild rain turned into a torrential downpour slowing us down considerably. We reached our destination around 1:00 a.m., where our hostess was waiting for us. Icelandic people are as delightful as their land. We had planned to hike remote Hornvik area for a couple of days, which turned out to be one of the memorable and adventurous experience, that’s a story for some other time. After three days, we were back on the road, weaving in and out of fjords, stopping every two miles to take photos, we reunited with ring road and inched towards Akureyri, the capital of the north. A charming little town, perfect stop to get ready for next adventure. We took full advantage of the midnight sun, driving alone for hours and stopping frequently we reached our hostel at 3 am. Goodnight rest, refreshing shower, hearty breakfast and we were in top spirit for next detour to Goðafoss waterfall. Spectacular cascades forming an elegant 30-meter wide semicircular arc is a sight to behold. Kids ran about on lava field pretending to be on a strange planet. Continuing our drive, we reached Husavik in time for a whale watching tour, though we missed museum which closes at 6 pm. We were fortunate to see four giant humpback whales feed on krill. Watching those large animals, I wondered what it would be to see a blue whale at such proximity. Nia had been trying hard to contain her excitement to ride an Icelandic horse, and we spent rest of the evening trotting those elegant horses next to the ocean. Late at night, in our tent at Myvatn, I gazed at the star-studded sky and cried with overwhelming joy. We spent two days exploring Myvatn lake, Námafjall Hverir and hiked around Leirhnjúkur Lava Fields. Kids were still pretending to be on a planet in a far-away galaxy, bouncing off on mossy fields they were the happiest ones. Those lava fields are a time machine, offering us a glimpse of our planet’s violent past. In the evening, we soaked ourselves at Myvatn Natural Baths, which are smaller, cleaner and less commercial version of Blue Lagoon. Time to pack the bags, and take next detour. This time for a wild and fierce waterfall. Dettifoss waterfall, the most powerful waterfall in Europe. Worth of taking a detour, if you have time. We roamed around for a long time, absorbing the wildness, contemplating the meaning of life, while kids were tending to their curiosities. This night, we pitched our tent at a beautiful private campsite at Egilsstaðir. Next day was an extra special day for kids, who had fallen in love with those adorable, orange-beaked birds at first sight in Husavik. The birds are known to locals as Lundi, to us puffins. We got off the ring road for a little town Borgarfjörður Eystri, which has one of Iceland’s largest puffin colonies. If you love those awkward birds, this is the place to observe them at a close. Once kids said goodbye to all the puffins, whom they have been naming for last two hours, we were ready to drive on. Back on the ring road, driving through the iconic untamed wilderness and winding black sand coastlines of eastern Iceland we rolled towards Hofn. We weaved in and out of fjords all day without any town for many miles. This part of the drive was very photogenic and especially irresistible. Today’s destination was Skaftafell campsite, and here we had planned to stay for a couple of nights to hike in the Vatnajökull National Park. This national park covers nearly 14% Iceland, and two days are not enough for it. We walked to a well preserved old Icelandic farmhouse, Svartifoss waterfall, to the glacier mouth. Svartifoss is a special waterfall, very distinct from other waterfalls. Black columnar basalt formations beautifully frame this waterfall. Before hitting the road, we went to see much famed Jökulsárlón Iceberg Lagoon, created by the slow melting of Breiðamerkurjökull glacier. Giant blue-tinted icebergs with a backdrop of black volcanic sand was a jaw-dropping sight. When we started from Reykjavik, our hearts were full of anticipation, as we drove back to the capital we were overflowing with deep admiration. Iceland is not a trickle of emotion. It’s a roaring flood, a tidal wave of feeling that lifts you up and carries you along for a ride. Keep at least 7 days to complete the trip. Keep an eye on the weather. It is very fickle in Iceland. Pack plenty of toilet paper and a shovel, especially if traveling with kids. Keep a healthy stock of water and snacks. Download maps on your smartphone before hitting the road. Remember to charge your camera batteries every night. If staying in hotels or hostels, book them in advance. People at hostels will ensure you will have the key to get in, in case you reach there at odd hours like us. Smile a lot, Icelandic people are super friendly and very helpful. Fill the gas, whenever you see a gas station, it may take a while to find the next one. I am sharing some lessons learned about gas here. Never select to fill “full tank,” in Iceland pre-authorization amount is $250 vs. $1 in the USA. When I saw that charge on my card, it freaked me out. Take a debit card with a chip with you to use at the gas stations or buy prepaid cards from N1. N1 has the most gas stations in the remote areas. Self-serviced gas stations accept chip card with pin. We love road trips and I was actually looking into a road trip for Iceland. This is a perfect guide! The Myvatn thermal baths look fantastic and even better that it’s cleaner than the Blue Lagoon. I’ll remember the tip not to select ‘full tank’ when filling up the tank! Thanks Lana. We try to avoid touristy places and Myvatn hot spring is far better than Blue Lagoon. I fell in love with Iceland just driving the Golden Circle with you here via your amazing photographs! I *really* hope to get to experience Iceland myself sometime very soon. Iceland is incredible country. We also hope to go back there sometime soon. All the best! It’s crazy they pre athorized 250$! Here in Finland you can select the amount, and they only charge the card with the sum you actually spent. I am glad you like me post. In Iceland, 250$ was released after few hours, in Mexico the petrol pump charged us $380. Later we found out about this petrol pump scam. Iceland is on my list! Looks absolutely beautiful, and those puffins are adorable!